At many restaurants, I enjoy simply being served. At others, I want to walk into the kitchen and learn what the cooks are doing so I can do it myself. Pizzeria Verità falls into the latter category. On my first visit to the popular downtown Burlington restaurant, I sat at the back counter and watched the action around the wood-burning oven thinking, I wish they would tell me the secret to their dough. Last Tuesday — National Pizza Day, as it happened — they did just that. In fact, I learned a lot over an entire shift spent with the staff. They even let me dress and deliver pizzas. Mostly, though, I observed. When I arrived around 4:15 p.m., the hostess was already busy fielding phone calls. 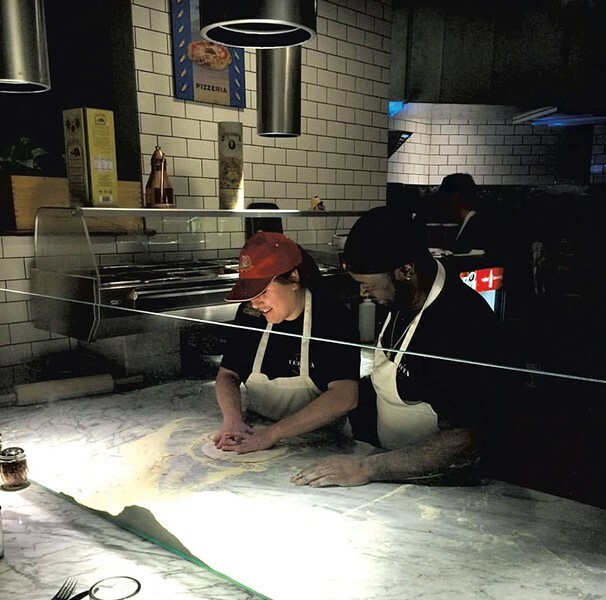 I was quickly outfitted with an apron and a hat, as well as a shirt that stated, La verità e nell'impasto — "The truth is in the dough." Then I met Griffeon Chuba, 21, my guide for the evening. He was tending the oven, pulling out the first pizza of the day. He turned the pie to another employee and paused, so she could snap a few photos for the restaurant's social-media post. Unsure when the mob of diners would hit, I opened my notepad and started with my questions. Chuba had arrived two hours earlier — that's the amount of time it takes to heat the oven to a blistering 850 degrees at its center, he said. To keep that temp steady, he grabbed a piece of wood from under the oven and placed it in the fire. More wood was piled in stacks behind the oven and near the hostess stand. Sourced from Clifford Lumber in Hinesburg, it's mostly maple but also includes beech or yellow birch, depending on the batch. Co-owner Rao handed me a plate of mozzarella; his face lit up as he explained that it's made in-house every day. He watched as I popped a square of the cheese in my mouth, pausing to take in the flavors. Suddenly, Rao looked slightly panicked. "I haven't tried this today. Maybe I should try it," he said, sampling a piece. Relief. "Oh, that's good," he enthused. "Can you taste the saltiness?" I nodded. It was salty, soft and perfect. 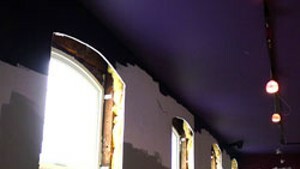 Rao then led me down some concrete stairs to the storeroom below the restaurant where he pointed at a pallet of flour. "Soft wheat flour type 00," the bag read, followed by "Farina di grano tenero tipo 00." "See that?" Rao said, pointing at the numbers. The zeros indicate how finely ground the flour is, he explained, and 00 is the smallest available option. Fine-powdered Antimo Caputo pizza flour from Italy is — or was until now — his secret. I looked at the pallet again and asked the obvious question: "Isn't it insanely expensive to ship this from Italy?" To which Rao replied, "It's worth it." He led me to the walk-in refrigerator and picked up a can of tomatoes. "See these?" he asked. "San Marzano. 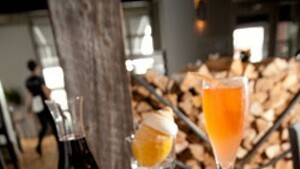 When you have the right stuff, you don't need to hide the ingredients." 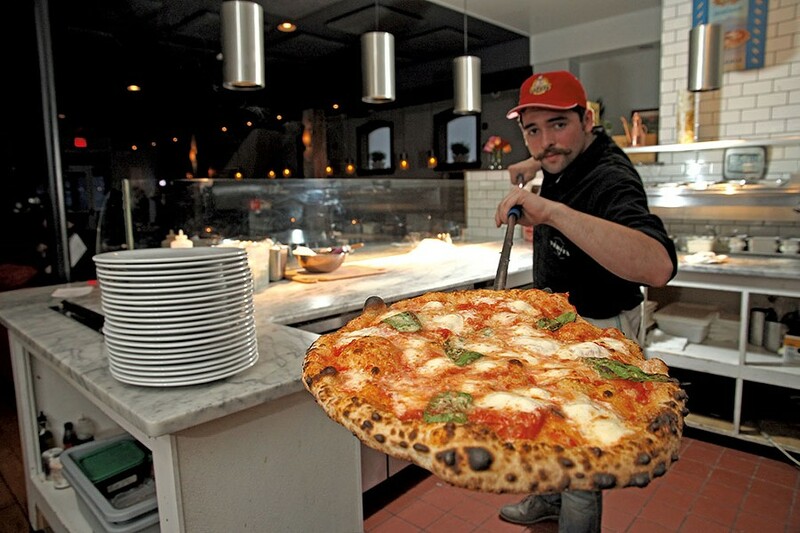 Rao admitted that when he first started planning the pizzeria, he couldn't get his sauce right. He experimented with all sorts of spices and finally called a friend for consultation. "He said, 'If you have the right tomatoes, it's just tomatoes and salt.'" Another secret revealed. Griffeon Chuba pressing pizza dough. Down here is where the dough is made, in a room kept at 65 degrees. The first day, it's left to quadruple in size inside its container. Then it's formed into balls and placed in the refrigerator, where it rises for two more days. 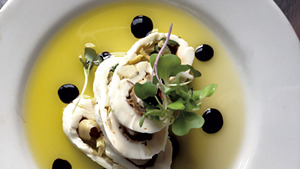 "If you serve good stuff, people appreciate it," Rao said. We walked back upstairs, past a sign that greets workers as they enter the dining room: "Be Polite & Work Hard & Good Things Will Happen." Meanwhile, Chuba was busy pushing more pizzas into the oven, which, come to find out, has a name. It's Karena, when "she" is behaving, he told me in an adopted Italian accent, complete with hand gestures. When she burns pizzas or is generally not behaving, the oven's name is Karen; Chuba doesn't like Karen. Next came the stretching. 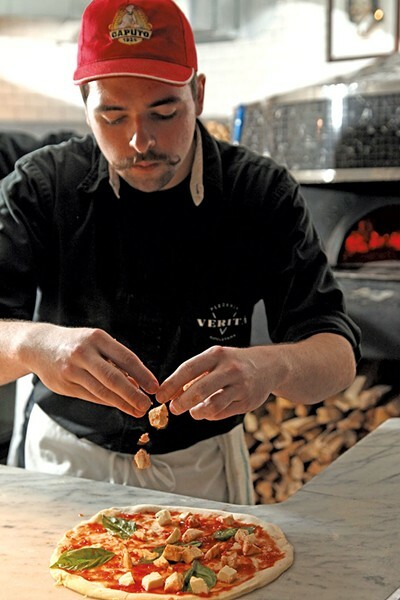 There's no tossing, beating or kneading dough at Pizzeria Verità. Instead, it's pushed, pressed and stretched — coaxed, essentially, into a pie shape. Chuba threw on some toppings, then picked up the pizza with a giant spatula called a peel. Then there was more dough stretching, to cover the shovel-like base of the tool. Chuba paused and looked at me. "This is the thing that's the hardest to learn," he counseled. "The outside of the crust should never be touched." But he made it look easy, quickly tucking the pads of his fingers under the dough and pulling outward. The pizza went into the oven and Chuba watched it for a full 90 seconds, adjusting the pie a few times before pulling it out and plopping it on the granite counter. For a few seconds, the pie was so hot that the sauce and cheese bubbled. Expediter Alex Ros, a 22-year-old University of Vermont student, quartered the pie in two smooth rolls of a pizza cutter and, in seconds, was halfway across the dining room. I asked Ros if he'd show me how to do his job, and he complied. In gloves too large for my hands, I waited for a pizza to appear. "Cut it," Ros instructed. I grabbed the cutter and aimed it toward the middle of the pie. "You gotta drive through it," he corrected, demonstrating again how to start at one end and swiftly push straight across. This one needed a handful of arugula and Parmesan. That, I could do. Ros told me we had to run a couple of pizzas to a table. I looked down at the tickets in a panic, trying to figure out who ordered what. I looked for seat numbers. Who is seat No. 1 and seat No. 2?! I thought to myself, flashing back to my restaurant days. It's a sin not to know which diner gets which entrée. Too late. We arrived at the table, and I didn't even remember what I was carrying. Luckily the diners laughed it off, and we left them to their dinner and returned to the kitchen. Griffeon Chuba making a pizza. I helped with a few more runs, then decided I should probably just watch. Time flew. As Streetlight Manifesto's version of "Me and Julio Down by the Schoolyard" came through the speakers, Chuba and Ros started singing, "The Mama pajama rolled out of bed, and she ran to the police station..." Ros wiped down plates. Chuba dropped out to focus on stretching dough, then put a pie in the oven. "You got a Nutella in there?" Ros asked. "Atta boy. Goodbye to Roooosie, the queen of Corona..."
By the time the dining room calmed down, I could no longer manage my hunger. I asked to make my own pizza. 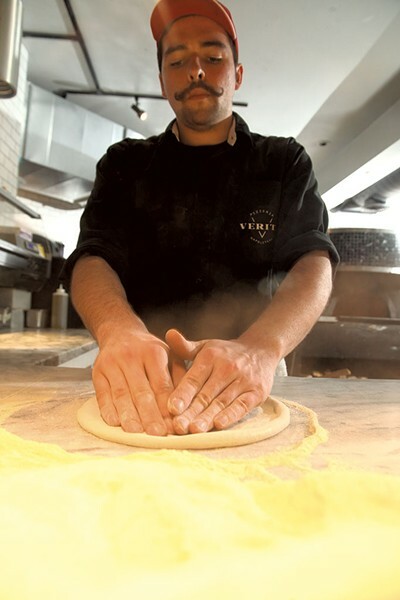 Bruce Ringgold, the pizza maker who has been with Verità since the beginning, stepped aside for me. He showed me how to rock my hands back and forth to press out the dough and patiently waited for 10 minutes while I completed the task he normally does in just two. 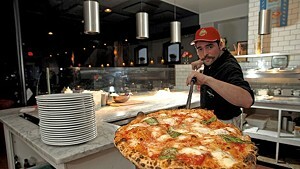 Chuba explained what to put on my Mais pizza: a spatula of crème, corn, speck, fior di latte, basil, Parmigiano-Reggiano. He scooped it into the oven, and I stuck my face dangerously close to the fire to watch. A minute and a half later I was at the bar, proudly eating the most beautiful pizza I'd ever made. The Verità staff generously taught me their secrets, but they needn't worry. There's no way I could make this at home unless I order pizza flour from Italy, make mozzarella from scratch and install a brick pizza oven in my rented condo. Maybe, after all, this is a place where I'd rather simply be served. The original print version of this article was headlined "Show Me the Dough"